This caricature shows William Hartnell (1908-1975) in the Crazy Gang's revue Knights of Madness at the Oxford New Theatre on 3 March 1950. It was drawn by Gilbert Sommerlad (1904-1976), a rehearsal pianist and orchestral violinist at the Brighton Theatre Royal from 1932 until 1936, and at the Oxford New Theatre from 1936 for over forty years. Sommerlad sketched the stars on stage when he wasn't needed in the orchestra pit, compiling the sketches in a series of albums. Pencil, ink and watercolour caricature of William Hartnell in Knights of Madness, New Theatre Oxford, 3 March 1950. 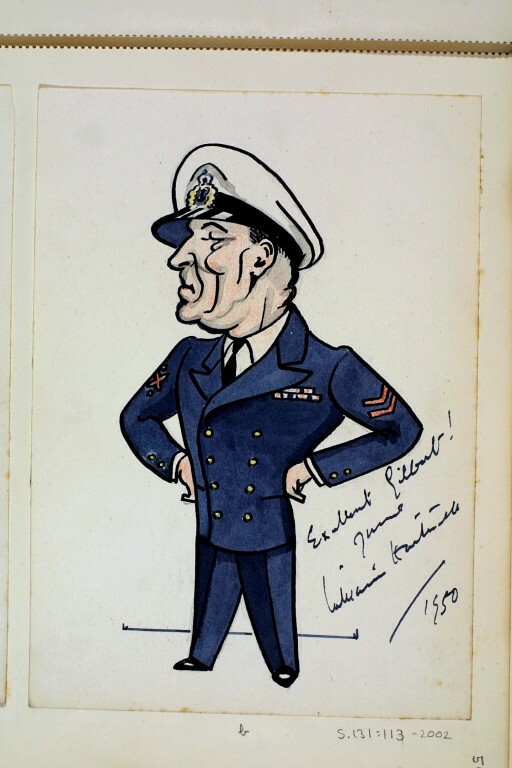 From a hard-backed sketch book containing caricatures of theatrical performers and entertainers drawn by Gilbert Sommerlad. 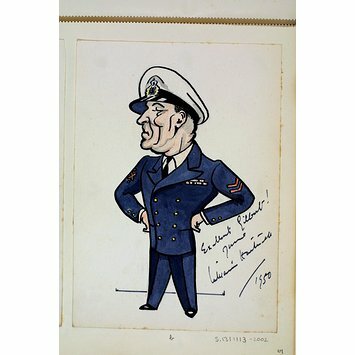 Pencil, ink and watercolour caricature by Gilbert Sommerlad (1904-1976) of William Hartnell in Knights of Madness, New Theatre Oxford, 3 March 1950.